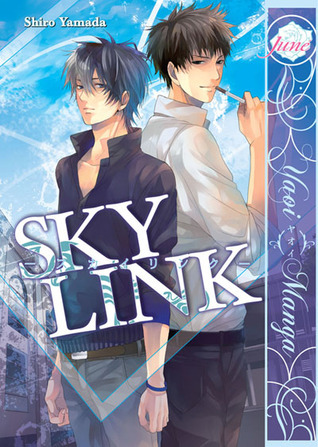 **** Sky Link-Ritsuki is wandering through life with no goals and no purpose. His divorced parents went their separate ways and he goes to university at the request of his aunt and uncle. He doesn't realize that the stranger that crashes into him is about to bring some unwelcome change to his life.Takagi is the new instructor in East Asian Studies, a job that he never thought he would be cut out for or be good at. He crashes into Ritsuki outside the university and feels an instant connection. Takagi doesn't hide his attraction for Ritsuki and tries his hardest to break through Ritsuki's defenses, even as an admirer of Takagi's insinuates himself between them.Both men have something in their pasts that they want to forget or just surpass; for Takagi-a famous journalist before he started teaching-is the death of a colleague and for Ritsuki it's a little unclear as the guy that seems to be stalking him is never really identified (was it a gang member, a psycho ex,...). Takagi sees something of himself in Ritsuki, but he also realizes it's not just their kindred spirits that brings them together; like him, Ritsuki loves to watch the sky.Takagi makes Ritsuki a promise, for him to study photography. If he gets good enough, Takagi will take him anywhere he want to go....half a year later, Takagi fulfills his promise. *****You through a kaleidoscope pt. 1 & 2-Kazu & Yuki are friends. Half Japanese and half English Yuki has always been bullied for his looks and Kazu has always protected him, even though he always looses the fight and ends up getting beat up; but Kazu can't help it as he's always loved Yuki. The only problem is that he's never confessed his feelings and feels he doesn't deserve to-he's always believed that he destroys all the beautiful things he touches. Then Kazu's friend shows an interest in Yuki and he makes the choice to finally reveal his feelings. After all, Kazu's favorite things are rooftops, bicycles, riverbanks, children's books, kaleidoscopes...and snow (yuki).These stories were sweet and full of hope. The character's emotions were beautifully portrayed and the illustrations were really well done. The 2nd story was better than the first, but anyway also this one was a bit boring and both had some things I didnt like. The graphic wasnt bad.